We have been waiting to hear news about the U.S. arrival of the Sony Xperia Z since CES, where we spent some hands-on time with and generally came ahead with positive thoughts. 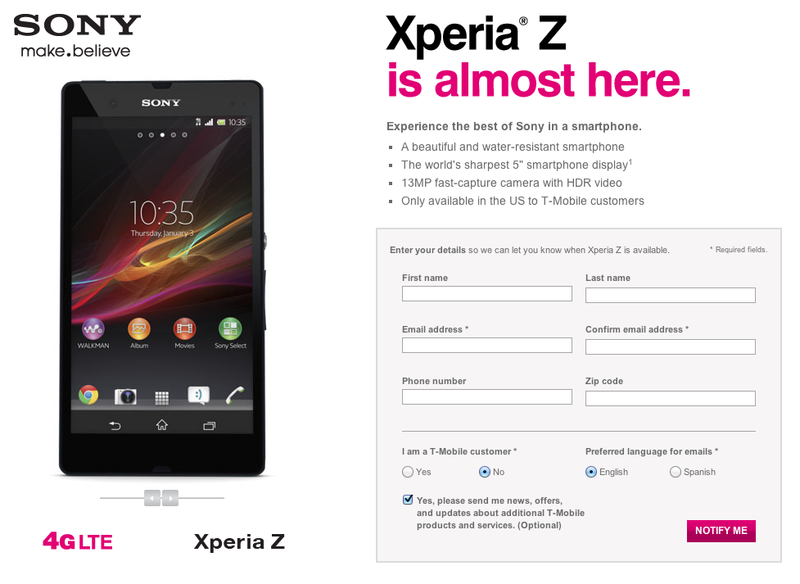 Unfortunately, today’s news is that Sony’s newest flagship is going to be a T-Mobile exclusive when it finally launches. We weren’t given an exact time, but sign-ups for the launch in “the coming weeks” are live right now. The Xperia Z is no slouch when it comes to specs, including a 5″ 1080p Reality Display and 2GB of RAM. It has the Snapdragon S4 Pro processor powering it and features a huge 13MP camera on the back as well. It’s a phone that could certainly catch people’s eye and change the perception of the Xperia line of phones, but unfortunately exclusives are all the rage these days so only T-Mobile customers will get a chance to purchase this device. If you are one of those customers however, sign-ups are at the link below.